Seven (7) short guides to help you and your congregation create an atmosphere of welcoming and inclusion for interfaith couples. The pamphlets include: Creating a Language of Inclusion; Creating and Guiding a Keruv Committee; Creating a Synagogue Based Keruv Initiative Staff and Holiday Issues of Conflict; Keruv and Implications for Synagogue Policy; Journeys: Stories of Interfaith Families; Children from Intermarried Families: Religious Schools Confronting the Challenge. 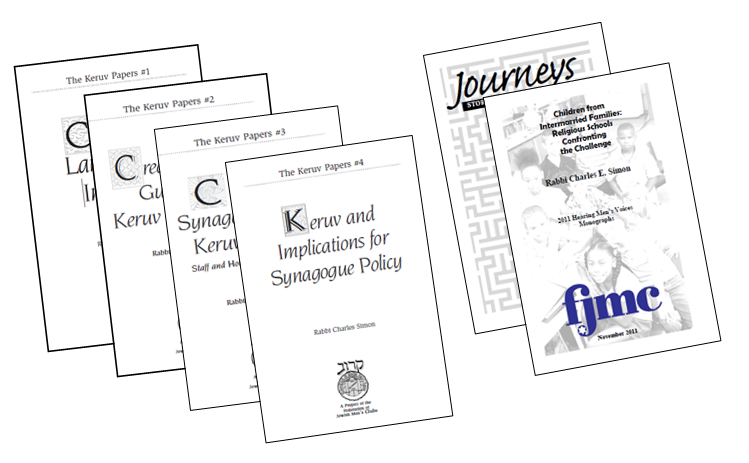 For a FREE download of these guides, refer to the Keruv Resources page here. The guides may be found in the section titled "Writings of Rabbi Charles Simon, Executive Director, FJMC". FJMC price includes ground shipping.